One of the most beautiful things about living in New York is the close proximity of diverse strangers… for any the people-watchers among us, it’s always fun to imagine someone’s “story” as they pass by you in the street. The Moth, I found, was a poignant reminder and perfect exhibition of these people-stories. 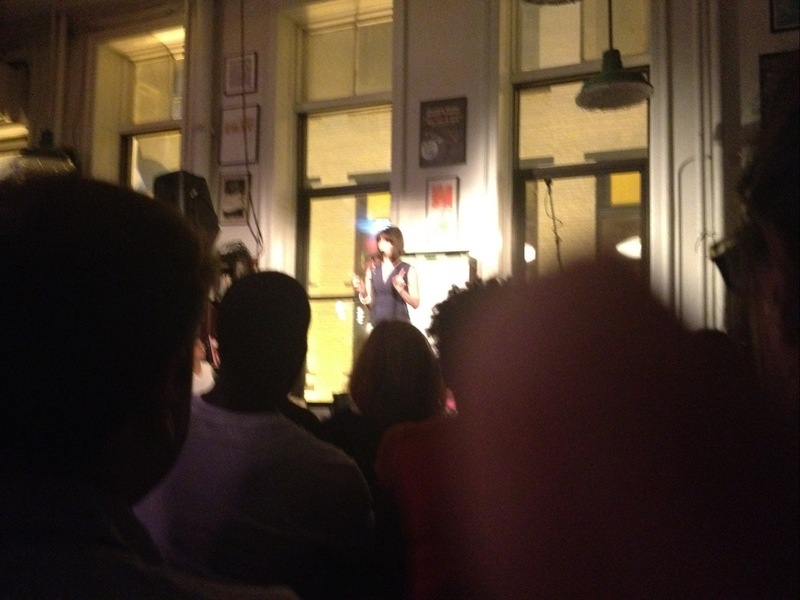 On Tuesday night I attended a Moth “slam” at HousingWorks Bookstore and Cafe in SoHo, NYC. In recruiting friends to attend my first ‘slam,’ I found that most either friends either a) got super excited/defensive “You’ve never been before?! How is this possible? I love the Moth!” to b) very confused “Is it a movie? Is it comedy? Is it real?” The best five-second-summary I can give you is to say that it is a series of 5 minute “improv stories” from members of the audience/people like us. -Each “slam” has a theme (Tuesday’s was “chemistry”) and when you arrive, if you have a story you’d like to tell, you are welcome to drop your name in a hat. -Doors opened at 7pm (which was really more like 7:30) and the line was already down the block by the time I arrived at 6pm. It sold out, and many people were standing, So get there early. -A host (ours was the funny/spunky Ophira Eisenberg, host of NPR’s ” Ask Me Another”) warms up the crowd and introduces each of the 10 storytellers (whose names are pulled from a hat). -After each speaker, 3 panels of judges vote (scores are on a generous 7-10 scale) to ultimately decide the winner and “best story” of the evening. -Between speakers, the host (in this case, Ophira, pictured above) makes jokes and reads from little q&a notecards the audience filled out while waiting for the slam to begin. Our notecard question read: Like oil and water, what two things in your life just don’t mix?” Funny responses included things like “Man Sandals” and “My husband and my boyfriend.” …Eep. All in all, the moth is kind of a fun club of (I’m just gonna say it though I love you guys) nerdy curious people. In line and in the audience I met a slew of really interesting and diverse people who were either avid listeners or at their first event, from doctors to marketers to college students. -An actual (immensely charming) staff member of the Moth who told his story about working as a weld inspector amidst oil spills in the gulf, whose life and professional awakening was eventually prompted by a silent brotherly understanding with a lost shark. The moral of the moth, for me, is that people are fascinating, and fascinating people go to the moth. If you’ve found yourself doing a bit too much introverted ipod walking on the subway lately, for only $8, you too can be re-enchanted by humankind. Peep the schedule here. And let me know if you go, ’cause I’ll be there too. Previous Post “Our Little Nerd Circus” – Radiolab LIVE!